Join us and our local experts on a Yorkshire Dales Tour. These tours allows you to experience the extended Yorkshire Dales Cycleway. The existing route was extended in 2016 and now takes in a stunning section along the side of the Howgill Fells and through the Westmorland Dales, before heading up to the highest pub in Britain at Tan Hill. The tour starts in Skipton (or Ilkley) and is a 250km clockwise circular tour of Yorkshire Dales. A typical tour covers the route in 3 days, an average of 83km miles cycling each day, a feast of cycling for keen road cyclists. You will experience challenging climbs, many included in the UK’s 100 Climbs book by Simon Warren, as well as iconic and breathtaking roads, many used in the Tour de France and the Tour de Yorkshire. The number of days can be varied if required, for example, a real challenge would be to ride the route in 2 days, or alternatively you may want to reduce the average km per day and complete it over 4 or 5 days. We meet you at the start of the tour and ensure you have everything you need and then transport your luggage between overnight stops. Accommodation is in carefully chosen small hotels of character in small villages, with typical Yorkshire Dales facilities including good food options and pubs of real Yorkshire character. 23-26 May & 11-14 July - GROUP TOUR OPTION. You will ride with an experienced ride guide and also enjoy a group dinner each evening. A great way to make new friends and enjoy the experience together as a group. Prices £369 sharing & £444 Single Occupancy. We can also create bespoke tours and trips based on your specific requirements so get in touch with us to discuss your Yorkshire Dales Tour! Route description: Only a few kilometres into the ride you will crest the ‘Cote de Barden Moor’ (used in the 2018 Tour de Yorkshire) and get a fabulous view of the Yorkshire Dales, which will certainly whet your appetite for what’s to come! You then experience a section of beautiful Wharfedale before heading to the iconic Malham Cove. You climb the famous ‘Cove Road’ and take in the view of the rock face of the Cove as well as the ‘limestone pavements’. The route then takes you through the market town of Settle and onto to Ingleton before taking a delightful quiet road to your overnight stop in the secluded village of Dent. Route description: Today you get to the furthest reach of the Dales and the ride starts with glorious views of the Howgill Fells as you head up to Orton, with its famous cafe, pub and chocolate factory! A superb section of road follows as you head east via Kirkby Stephen to the Tan Hill Inn, the highest pub in England. A real treat follows with a long descent down to delightful village of Reeth for the overnight stay. 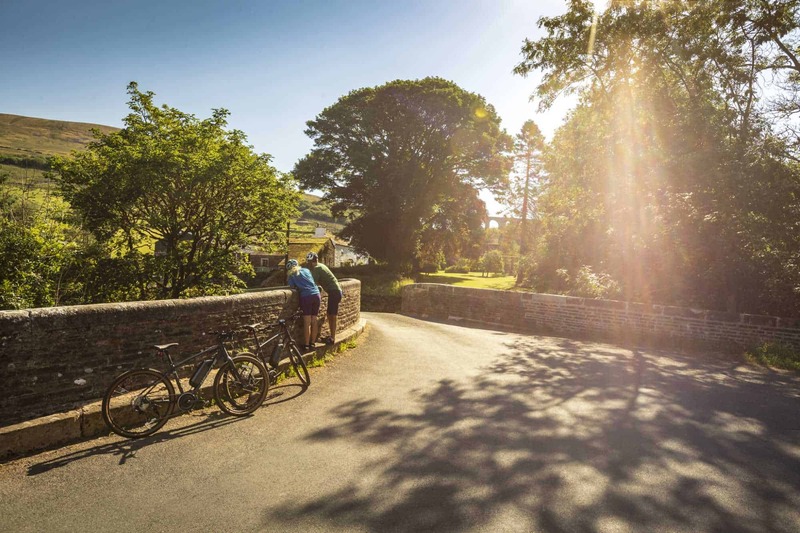 Route description: You are now back on the original Cycleway and enjoy a classic ride today taking in 4 of Yorkshire’s finest valleys: Swaledale, Wensleydale, Coverdale and Wharefdale. Start the ride on a climb used in the 2014 Tour de France, the Cote de Grinton Moor which takes you over to Wensleydale. A slight detour will take you past the breathtaking Aysgarth Falls before heading over to Coverdale, a real ‘hidden gem’ of a valley. You wind your way up to the top of the ‘Cote de Park Rash’ as it was named in the 2018 Tour de Yorkshire and descend into the village of Kettlewell, famous for its annual scarecrow festival! It’s now a rolling valley ride back to the start down the Wharfe Valley through Grassington, Burnsall and Bolton Abbey, past the spectacular 12th century priory. Arrive back at the start / depart, or maybe stay one more night to enjoy a celebratory dinner and drink in Skipton or Ilkley. The weather can be changeable in Yorkshire regardless of the month so we recommend bringing wet & cold weather gear just in case. You do get up to around 1000 ft of elevation over the course of the Yorkshire Dales Cycleway. Full balance is required 10 weeks before the date of your Yorkshire Dales Tours. In addition, we also require the name, contact number and email address of all travellers.